Good morning! Ardyth here with my first try playing with AJVD's newest product, Inkpression plates! I chose the Paisley Plume plate (say that 5 times fast! lol!) and there's another one called Vintage Floral Flourish. They are both classic and elegant and perfect for all sorts of projects! For my first time playing, I tried simply inking up the plate and running it through my Big Shot. I tried different inks including die, Distress Oxide and Versamark. I ended up using Distress Oxide - the creaminess of the ink stays put on the plate without bubbling and transfers very well to the cardstock. Once I had my background inked, I cut it with the largest Stitched Dot Rectangle die. Then I worked on creating a layout. I have used the Minnie Pearl Bookmark die before as a sentiment strip, this time, after I cut the bookmark, I placed it in the largest Stitched Dot Rectangle at an angle. I cut down the inked panel, adhered it flat to my black cardbase and then popped up the sentiment strip. For the sentiment, I cut out 'Greetings' from the new Poinsettia Greetings dies 3 times - twice with white cardstock, once with gold glitter cardstock. I layered them up for some dimension. 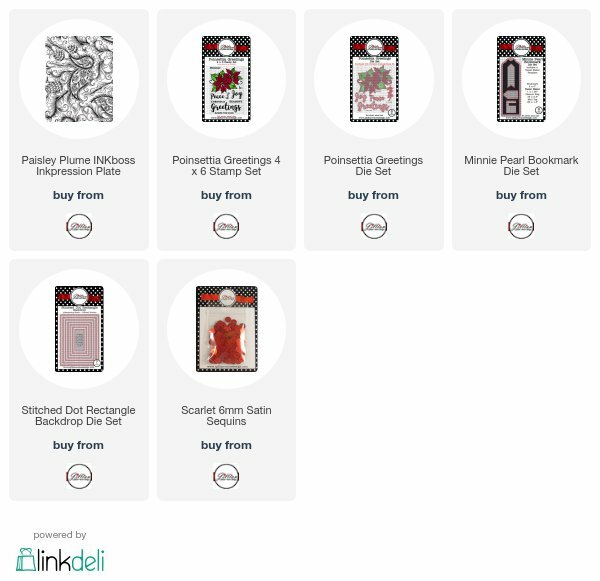 I stamped 'Season's' from the Poinsettia Greetings stamp set. Then I had some fun! AJVD's red satin sequins are so pretty - they're flat and not shiny they seem to glow in the light rather than shine or sparkle. I ran a line of glue under the popped up edge of my sentiment strip and laid my sequins side by side to create a red scalloped border. I also cut a couple of the sprigs with gold glitter cardstock as an embellishment. 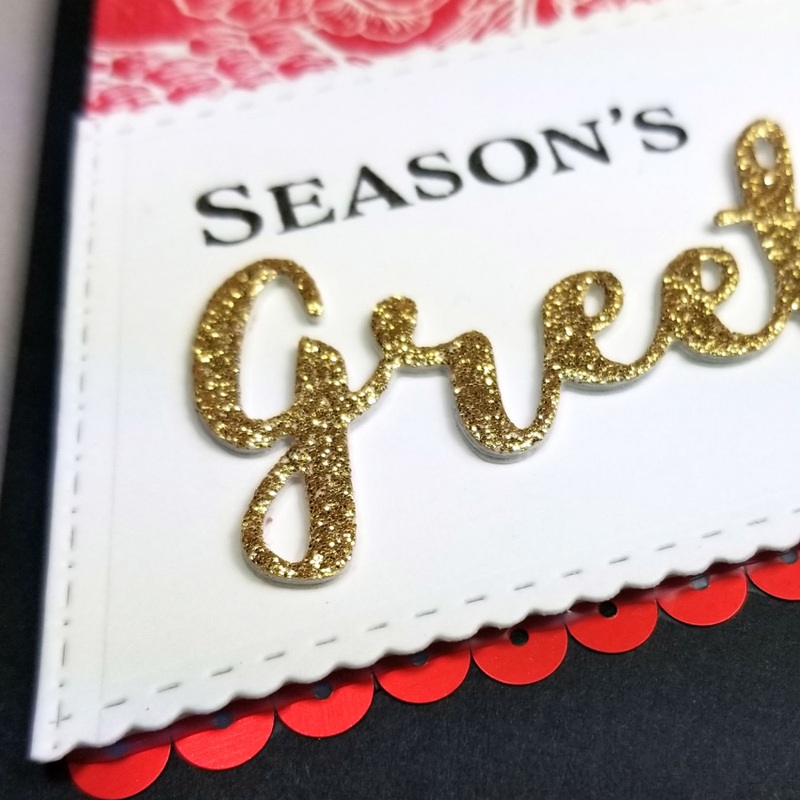 Pretty finishing touches to an elegant Christmas card! Here's a quick video so you can see it in action! All I have to say is Wow...gorgeous! Absolutely beautiful, Ardyth. Thanks for sharing.